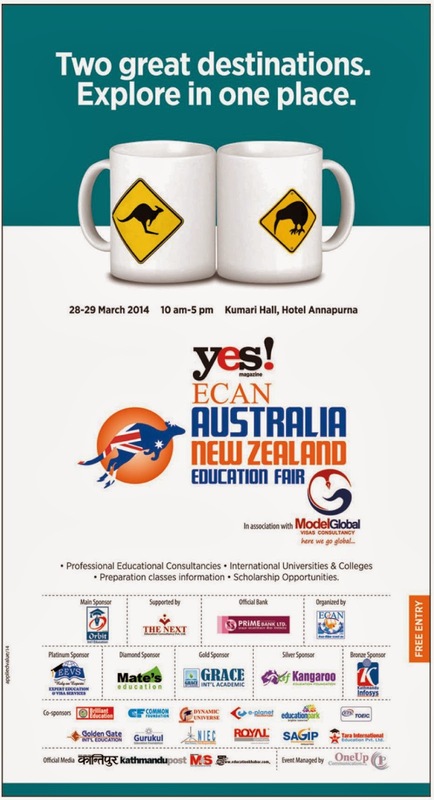 The Educational Consultancy Association of Nepal (ECAN), in collaboration with Model Global Visa Consultancy, is set to organise Australia-New Zealand Education Fair 2014 in the Capital next week. The two-day event to kick-off on Friday aims at providing students an opportunity to acquire first-hand information on the various prospects of education in Australia and New Zealand. According to the organisers, students and parents visiting the exhibition will be provided free counselling on careers, courses, education fees and visa procedures. ECAN Vice-Chairman Ram Chandra Poudel adding, adding that through the fair prospective students can information regarding their study and stay. A record at the Ministry of Education shows that the numbers of students taking No Objection Certificate letter for Australia has crossed 8,000 in the eight months of the current fiscal year. The organisers are expecting around 20,000 visitors in the event to be managed by One Up Communication. ECAN is an umbrella organisation of 260 education consultancies across the nation.